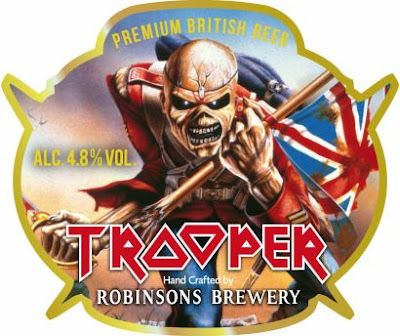 Iron Maiden and UK brewers Robinson’s will launch of the band’s Trooper beer in select Robinson’s pubs on the evening of May 9. A list of pub locations can be found here. A recent report in The Sun says the product is experiencing record sales in advance of its official launch, with Robinsons is having to work a six-day week to keep up with demand. Over a quarter of a million pints have been pre-sold in the UK alone, and more than 100 countries have applied to stock Trooper beer. The company is brewing three batches a day for the first time in their 175-year history. Named after one of Maiden’s most popular songs, “The Trooper,” from 1983’s “Piece Of Mind,” was created with the help of singer Bruce Dickinson.